A few months ago I heard about the Packasso Project, which is a group of Omaha South High Magnet School students who apply their talents as graffiti artists to beautify the community. I found their Facebook page and was immediately impressed with the quality and range of their work. Their quality speaks for itself in the picture below, and, as for their range, on their Facebook page you will find a colorful pickup truck, school buses, and both indoor and outdoor murals. I found their artwork to be sophisticated yet playful and wanted to learn more, so I scheduled to meet with their sponsor at South High, Fairouz Bishara. Mrs. Bishara told me about group’s background and explained that Packasso Project was born in an attempt to hone the skills and redirect the artistic abilities of graffiti artists at Omaha South High School who were using the wrong canvas to express themselves. She added that despite being talented artists, some of the members were struggling in school and at risk of not graduating. After discussing ideas on how to collaborate, we decided that Packasso could liven up the D2 Center conference room with a mural. The development process was very professional. D2 Center staff met with Mrs. Bishara and the Packasso artists to discuss mural ideas, and, a couple of weeks later, we reconvened to see the sketched out ideas. The students enthusiastically ran the meeting and presented four options. They were all excellent, but two stood out the most. 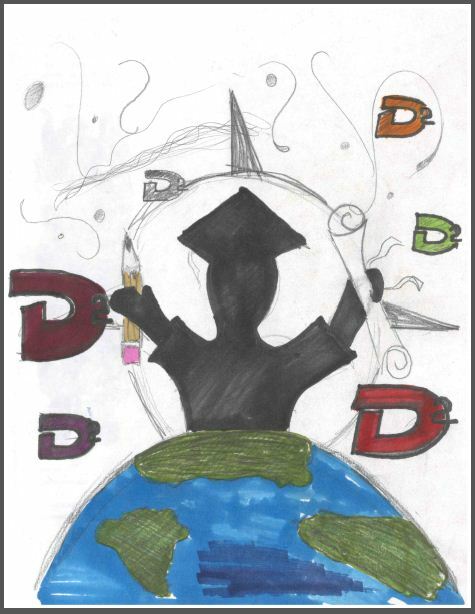 As a group we morphed both ideas into an inspirational piece which encompassed the D2 Center’s mission: to re-engage youth who’ve dropped out of school by providing them with support and opportunities to earn their high school diploma. 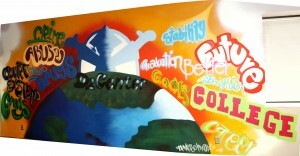 Understanding that there are various reasons why D2 Center students have disengaged or dropped out, the mural would identify some common barriers through darker imagery, and then through a lively transition, illustrate the positive outcomes that will come from participation in the D2 Center and attainment of a diploma. Now that the development process was complete, it was time to let the talented artists do their thing. Once they began, it was a bit nerve-wracking to see a freshly painted wall in a renovated office building being spray-painted. But, now I cannot imagine the D2 Center without the colorful and inspirational mural. The students diligently worked for two consecutive weekends and two weekday afternoons. They put in 40-50 hours of hard work. Now, visitors to the D2 Center comment on how wonderful the mural looks and it also serves as a great visual which helps us explain to potential students, service providers, and community members what the D2 Center is all about. Big thank you to the Packasso Project and Mrs. Bishara! Update 1/13/2012: Here’s a time-lapse video of the mural creation process on Vimeo.